A bit of background: I spent several years building online ad tech for bands, so music plays a big role in my personal and professional life. 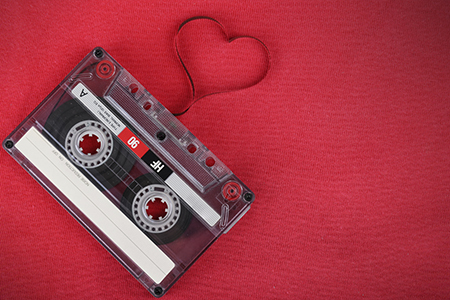 So now I bring you a throwback musical creation that used to be an integral part of Valentine’s Day a few decades ago… the mix tape. Real estate is a relationship business. As an agent, you build relationships with people at a high impact time of their lives: buying or selling a home. And usually it goes well. NAR reports that 88 percent of buyers and sellers say they would hire their real estate agent again. But here’s the kicker: that same report says that only 44 percent actually do. That means half the people who worked with a specific agent did not end up hiring that agent again, even though they wanted to. Well, a few things might have happened. First, maybe they lost their agent’s business card. Or maybe they changed their phone number. Maybe their brother became a real estate agent—an informal survey revealed the average person knows three real estate agents. But whichever happened, one thing is clear: the original agent dropped the ball. That agent was no longer top of mind when the client began another real estate transaction. You want to be the top of mind with potential buyers and sellers before you get to know them and while they are researching real estate. That’s called prospecting. It’s also farming. (Of course, zip code-based brand ads from my company can help you do that). But once you are connected—once you know that person—your work isn’t done. Staying in touch means staying top of mind. And there are guidelines on how many times each contact should be touched. Recommendations vary, but one major firm says it’s 33 times in a year. That’s a huge time commitment! It’s practically a full time job in itself. That means you have to be very deliberate and strategic in the kinds of touches you use. As much as you know you’re supposed to do it, you don’t want to bother people. You especially don’t want to bother the people who already know and care about you. But bothering people isn’t about frequency as much as it is value. If you reach out to your sphere in a way that is somewhat disruptive but valuable, say with drip email or phone calls, they don’t mind it. But if you send the same canned email as a dozen other agents in your area and call your contacts every Tuesday, your sphere will be shrinking fast. Combining high touch, highly personal methods with low touch, passive methods is the right mix. And my company can also help with passive digital ads for your sphere. The average person sells a home and buys another every seven years. That means you have to play a long game. And that’s hard to grasp for many agents. “How do I keep that relationship going, when it may be three, five, 10 years before they are ready to do anything?” asks Coldwell Banker agent Andrea Geller. But she does. Because the numbers tell her where her business comes from. Taking the long view is also a strategic approach. A transactional viewpoint, such as viewing each client by transaction, means you value your client based on the commission you earned. But a relational viewpoint means that you value the relationship for the lifetime potential it can bring your real estate business. For more on this, check out our cool Lifetime Value Calculator tool. Your sphere of influence is a valuable entity and should be treated with valuable interactions. Stay in touch. Stay authentic. And never forget that we love you. *Per NAR 2015 Profile of Home Buyers and Sellers, 42 percent of sellers who used a real estate agent found their agents through a referral by friends or family, and 24 percent used the agent they previously worked with to buy or sell a home. That means 66 percent of your business comes from your sphere of influence.